Can Congress Mandate Health Insurance? This week, House Republicans passed a bill to repeal the new health care law. The bill is expected to fall flat in the Senate. Behind all the rhetoric over the health care law lies a constitutional debate over whether Congress has the authority to force Americans to buy insurance. Can Congress Mandate Health Insurance? 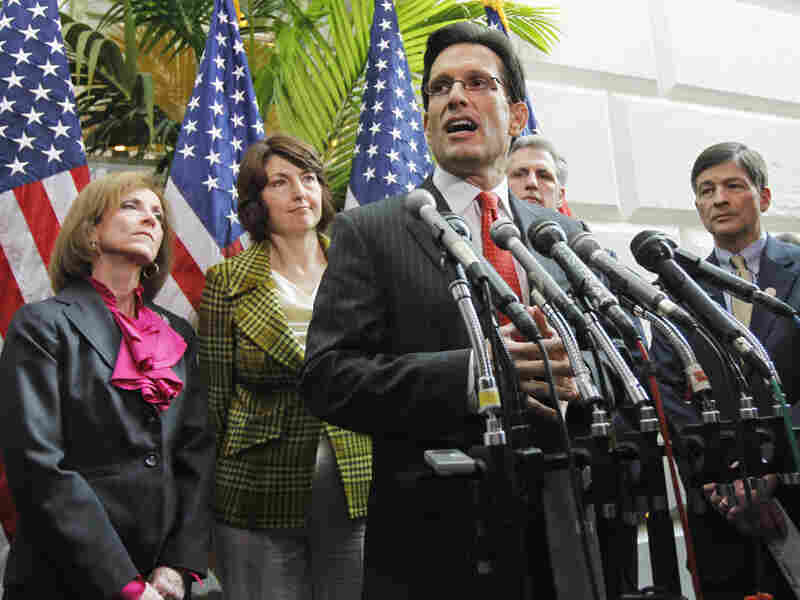 House Majority Leader Eric Cantor (R-Va.) discusses efforts to repeal the health care law Wednesday. The House passed a bill to repeal the law, but Senate Democrats say they will block efforts to take it up. Behind all the rhetoric over the health care law lies a constitutional debate over authority. One of the key objections for most Republican lawmakers against the Patient Protection and Affordable Care Act, signed into law last year by President Obama, is what's called the individual mandate — a provision that will require most Americans to become insured by 2014. Many Republicans, including Rep. Dan Lungren of California, believe Congress doesn't have the constitutional authority to make people buy insurance, and they object to the idea that everyone must have it. But as constitutional law expert Andrew Koppelman tells Weekends on All Things Considered host Guy Raz, Congress can trace its constitutional authority to mandate health care coverage to the Constitution's "necessary and proper clause." It turns out Congress already had passed a sort of individual mandate even before the Patient Protection and Affordable Care Act of 2010 was approved by the 111th Congress. In 1798, the Fifth Congress passed "An Act for the Relief of Sick and Disabled Seamen," which was signed into law by President John Adams. The law essentially established a national health care system for sailors, according to Adam Rothman, associate professor of history at Georgetown University. "The sailors [paid] a tax to the federal government, [which used] that money to set up marine hospitals around the country, specifically for sailors," he says. Sailors made up a critical part of the work force in the early days of the United States. "Foreign trade and the coastal trade [were] an enormous part of the national economy," Rothman says. "At the same time, it was a dangerous world. Sailors [were] being impressed into the British navy [and were] vulnerable to all sorts of diseases." The constitutionality of the law was a nonissue among lawmakers, according to Rothman. "Everybody accepted that it was a legitimate function of the national government, even though the words 'marine hospital' and 'relief for sailors' don't appear in the Constitution. It was justified under the commerce clause." Read more about the law on Forbes writer Rick Ungar's blog "The Policy Page." The idea behind the individual mandate is that as more individuals enter the marketplace for health insurance, competition will grow and the price for getting coverage will go down. But does Congress have the power to help expand the marketplace by compelling citizens to buy insurance? Lungren argues that citizens have the right to not to buy health insurance, and that Congress is overstepping its authority in compelling individuals to choose either to comply or face a penalty on their income taxes. He says that the Constitution's "commerce clause" does not enable Congress to mandate individuals to buy health insurance. He questions the notion that "if you refuse to enter interstate commerce — that is, if you consciously decide to be inactive — that in and of itself is a type of interstate commerce," and that Congress has the power to penalize citizens without coverage. Koppelman, who teaches law at Northwestern University, says that the Constitution's "necessary and proper clause" cannot be factored out of this debate. "When somebody goes without health insurance, we can argue about whether they are or are not part of interstate commerce, but it doesn't matter," Koppelman says. Koppelman says that in order to carry out its responsibilities, Congress can enact policies that are not among its enumerated powers in the Constitution. A common criticism of the individual mandate is that the provision establishes a precedent of overextending the authority of the legislative branch. "It's an extraordinary reach once you start to analyze what you are actually talking about," Lungren says. Koppelman acknowledges that Congress could abuse its authority, but he also emphasizes that it is "quite unusual for Congress to require people to do something." "The idea that we are on a slippery slope to Congress forcing you to do all kinds of things you don't want to do just misunderstands political reality," Koppelman says.